People told me parenting is the hardest thing they’ve ever done. People told me that no one knows what they are doing. When my wife was pregnant and during hard times of parenting, these are all things I heard from friends and acquaintances. They left something out. No one ever told me how often there is nothing to do. And, I don’t mean there’s nothing to do, so instead I’ll go eat waffles and watch “The Golden Girls” like I want to. I mean there is nothing you can do at times when all you want to do is do something. I mean the times your kid is struggling, sad, or in pain, and there is nothing you can do to make it better. Little ones face so many huge struggles. When they are itty-bitty, it’s being out of the womb, the rhythms of being awake and asleep. As wee ones, it’s figuring out the world of feelings, expectations, and identity. As they get older, it’s the emotional fabric of friends, intimacy, and isolation—the never-ending tumult of figuring out who you are and what you stand for. From the time they are wee on up until they leave the house, having a sick kiddo is always a time when you can do things that might help a little, but you can’t actually make it better. During all these times, there are small gestures, little things you can do that might alleviate some of the heaviness for the moment. But, really, there isn’t anything you can do that will fix, take away, or fast-forward through it. In the last few days, I have spent a lot of time sitting on the floor holding my crying kid. She’s been really sick. She’s teething. The time recently changed. She’s learning how to talk really quickly. She’s been going through a lot, so my often placid, happy kid has dissolved to tears and screaming more than once this week. She is little enough that when this happens she wants me to hold her. I know at some point in the future she will be like this and be crying, but she will want me to leave her alone. At least for now I get to feel like I am doing something by holding her close while she cries. Once upon a time, I was a yoga teacher. I recall yoga teachers throwing around the term “hold space“ with some regularity. I was never totally clear on the subject. It seemed like part of the idea was that as a yoga teacher you aim to create a space where people can come as they are and you as the teacher let them be nothing but themselves and let them seek what they need. I recall thinking it sounded quite vague but nice. I wasn’t sure how to actually do it while I was doing things like teaching people how to stabilize their hips during Triangle pose. 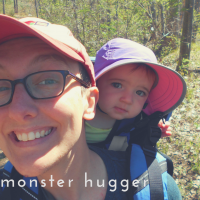 These times when I can do nothing for my kid while she struggles and hurts has taught me a couple things about what holding space might mean. See, what no one tells you is that holding space is heavy. That space is full of darkness and pain and struggle. It hurts to hold space. While you hold space, you hold your tongue so as not to make light of it. And you hold your hands behind your back so you don’t rush forward and fix it. And you hold your feet down so you don’t march forward, trudging and trampling through it. You hold yourself accountable to witness and silently acknowledge. You sit in the struggle with your child. You offer your presence and nothing else. This is what it looks like when you can do nothing for your kid: you hold on to everything. Doing nothing has never been this hard. Holding space has never been this heavy. No old wives’ tale or expert parenting advice will fix everything. It’s just a messy, tough process. I’m not even sure process is the right word. A process suggests something linear that progresses from one step to the next. This is often just a series of moments strung together with no clear outcome or direction. It’s moments of holding your kid, or being in the room, or being around just in case you’re needed. It’s letting them know you’re available while they go through this. It is tough, weighty, and bursting with love of the strongest and bravest kind. It’s the love that looks straight into darkness and doesn’t budge. It’s love that doesn’t fight or do heroic gestures, but stays still and quiet. It fills a room. It is as delicate and significant as the veins visible in your wrist. It is a sign of life and of giving life. You, oh dear one, who holds so many things and does nothing—you are sustenance.